2. History: Another recently opened restaurant, Etch is run by Chef Deb Paquette. They offer bar seating, dining room and an open kitchen with bar seating as well. The Encore tower is right across the street from the Pinnacle building. Sunday - closed, brunch coming soon! 5. Parking: Parking is a pain downtown. We ended up paying $5 at a lot and walked a block. 6. 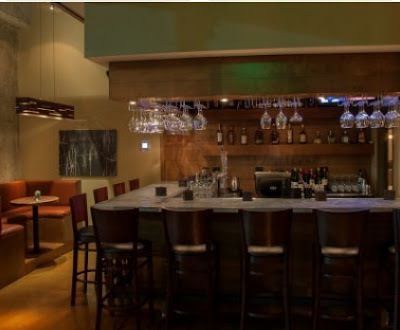 Atmosphere: Because Etch is located in the business district, the customers were professional and older. Pretty modern but not hip like most trendy Nashville restaurants. 7. Service: This one is hard to review because we stayed in the bar area, we were at a small table near the bar. We did not have traditional servers. But I felt like the bartender was not very professional. She always came to our table at weird times and carried herself pompously like we were bothering her. Pork Belly - We really liked the combination of cilantro, raisins and nuts but didn't care for the tofu. Duck Confit - Delicious with the candied orange peel and orange bread. I loved the balsamic blackberries. Butter Tasting - So good. This is on the dinner menu and it was the first thing Michael saw when we were browsing restaurants in Nashville. We had to keep ordering bread to finish it because we didn't want it to go to waste. It is like getting a cheese plate for dessert. Goat butter, truffle butter, smoked plugra butter, duck butter...mmmm. 10. Ranking: Based solely on atmosphere and our Happy Hour experience, we would give it a 6.5 . The food was good, but we weren't blown away and the service was mediocre. We feel like we need to have a true dining experience to really say whether or not we would go back.